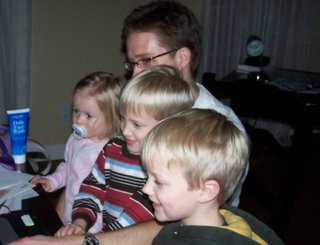 One of our kids' favorite pastimes is to watch movie previews on the computer. Both www.netflix.com and www.apple.com have sections were you can watch movie previews. The other night after dinner, Emma wanted to watch a preivew for the movie "Curious George". Then Ethan requested "Chicken Little". Soon, it was a movie preview fest. I didn't realize how many good kid movies have recently or soon will come out. Our Netflix list is getting pretty full. We may even take the kids to see one or two in the theaters. By the way, some of the songs on the "Curious George" movie are by Jack Johnson... I think this is a kid movie we will all really like!